The Myrtle Beech (Nothofagus cunninghamii) is one of Tasmania’s icon trees, and is the dominant component of Tasmania’s cool temperate rainforest. Where these dendrons attain their finest stature in some parts of Tasmania’s verdant Northwest and Northeast, they assemble grand cathedral or callidendrous (meaning ‘beautiful tree’) rainforests, which has for generations captured the imagination and awe of Tasmanians. Back 18,000 years ago, when glaciations in Tasmania were at their maximum (called the Last Glacial Maximum and henceforth abbreviated LGM), practically the whole of the island would have been unsuitable for the development of cool temperate rainforest, except in pockets of areas in the west. Such areas where plants survived during glacial periods are called refugia. In the present day, the Northeastern part of Tasmania has sizeable patches of Myrtle Beech rainforest. Yet, geomorphological and pollen-based data suggests that the entire Northeastern area was too arid during the LGM to support rainforest. The question thus arises whether Myrtle Beech trees had survived there in refugia during the LGM or whether they were dispersed from refugia from the west after the LGM? The immediate problem with the latter suggestion is that Myrtle Beech seeds disperse poorly over long distances, making it unlikely for seed to cross over 150 km from western refugia. Tackling this conundrum was the topic of Dr James Worth’s honours research and part of his doctorate studies. The efforts of James and his fellow investigators have culminated in a recent publication in the scientific journal New Phytologist. From his extensive fieldwork, James collected Myrtle Beech leaves from over 340 trees across the distributional range of the species, which includes both Tasmania and Victoria. Using molecular techniques, James then extracted the chloroplast DNA from these individuals and compared their DNA sequences. 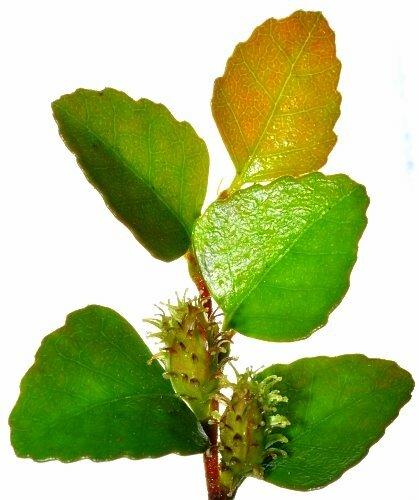 James discovered that a common signature in the DNA (a chloroplast DNA sequence that is called a haplotype) that exists for Myrtle Beech trees in Victoria and in numerous areas of Tasmania. The western part of Tasmania however, had an additional and significantly large suite of other endemic haplotypes, suggesting a complex evolutionary history of Myrtle Beeches in that area, and perhaps survival in numerous refugia, which is within expectations. In the Northeast, trees from two regions bore the common haplotypes, some in the western extreme (Mt Barrow), and some in the eastern extreme (Blue Tiers). In between was a central region (areas in the vicinity of Mt Victoria, Mt Arthur and Mt Maurice) in which a unique haplotype was discovered. At least for this central region, the presence of the unique haplotype is strong evidence that there must have been refugia for the Myrtle Beech in that area. James concluded that the Myrtle Beech withstood the aridity of the last glacial period within multiple regions in apparently inhospitable climates. 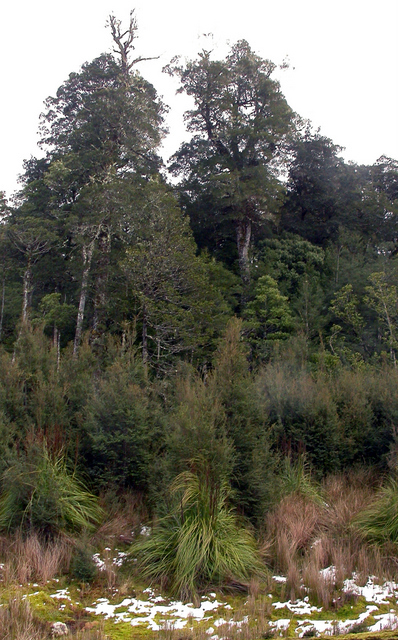 Whether cathedral rainforest actually existed in refugia in the Northeast during those times is questionable but if the conditions then were simply untenable for rainforest, Myrtle Beech trees could still have survived, being, as we are currently able to observe, able to occur as a compact shrub in harsh highland environments. This is where the true virtues of the Myrtle Beech comes to light. If Myrtle Beech did not survive through the last glacial, there would be no rainforest to speak of. Yet, Myrtle Beech did more than just survive through the LGM. Fossils suggests that it has been around for at least 780000 years. Myrtle Beeches have therefore survived through numerous cycles of glaciation. The resilience of this iconic temperate tree throughout the ages has unquestionably shaped Tasmania’s modern biota. This entry was posted in Biogeography, Botanical Heritage, Botany, Evolution, Fossils, Molecular Evolution and tagged Blue Tiers, callidendrous rainforest, cathedral rainforest, chloroplast DNA, cool temperate rainforest, cryptic glacial refugia, glacial refugia, haplotypes, last glacial maximum, Mt Arthur, Mt Barrow, Mt Maurice, Mt Victoria, Myrtle Beech, northeast Tasmania, Nothofagaceae, Nothofagus cunninghamii, refugia. Bookmark the permalink. This is my first time here via Festival of the Trees & I am pleased to find another Australian. Your post is very interesting. I have travelled through this area of Tasmania & well remember the stunning scenery. I hope the Tasmanian forests will be left to continue as they have done for thousands of years. Thanks David for this amazing background to the Myrtle Beech. I walked through the tall, moss-draped Myrtle Beech of the Otway ranges in Victoria a few weeks ago and was moved to deep silence and awe. This is a great site for learning about our trees. I am a new Tasmanian and it is great to find a resource to learn about native species. This post was especially interesting as I live in the NE and it would be interesting to look at trees that would have grown here originally when planting our garden. Thanks. Thanks Tim. Great to know you are writing a chapter on Tasmania. Would be keen to read it when it is out. Regards, David.